Military Sexual Trauma: A Little-Known Veteran Issue According to the Department of Veterans Affairs, more than 48,000 female veterans screened positive for military sexual trauma in 2008. Rachel Caesar, who served for 14 years, is one of them. She says that she was harassed -- and that it took her a long time to admit the effect it had on her. Until she talked about it, she says, she was "dying inside." 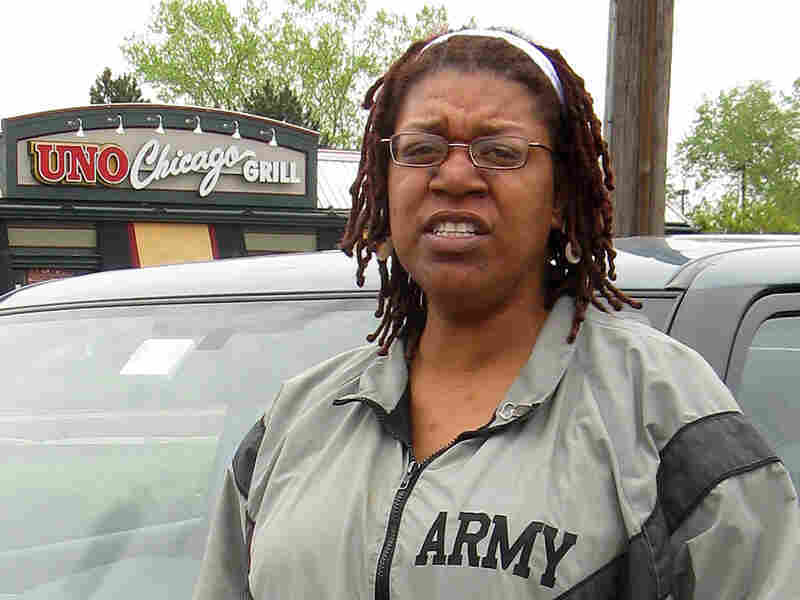 Rachel Caesar left the military after serving for 14 years. She suffered from military sexual trauma, but it took her a long time to admit it. According to the Department of Veterans Affairs, more than 48,000 female veterans screened positive for military sexual trauma just in 2008. Rachel Caesar first tried to join the Army after she saw a recruitment insert in Jet magazine. She filled it out and sent it in. She was 8 years old. It wasn't long before her mom's phone started ringing. Caesar's mom told the Army recruiter: "Maybe you'll see her in 10 years," according to Caesar today. Sure enough, after Caesar graduated high school, she joined the Massachusetts Army National Guard. But her experience didn't live up to the dream she'd had of the Army as a kid. In 1996, while on active duty in Korea, Caesar became pregnant. She says that after that, a noncommissioned officer sexually harassed her. "He told me plain out that I should have been carrying his children, so I should have been having a sexual relationship with him, and I would have gotten promoted," she says. I would take the kids down to the bus stop, put them on the bus, get back in the house, lock myself in the house, sleep all day 'cause I was up all night, 'cause I couldn't sleep at night because of the nightmares and everything. Years later, during a deployment to Afghanistan in 2003, Caesar says she was harassed again. She says she tried to get help from a chaplain, but that went nowhere. Eventually, her health declined -- a bad knee, migraines. She didn't want to complain -- didn't want to think of herself as a victim. "Even though I was sexually harassed, I didn't think about it because I wasn't raped," she says. "I was never raped. But I was sexually harassed on many occasions." So in 2004, Caesar gave up the only job she ever wanted to do. She left the military. At first, she and her two boys lived with her mother -- barely functioning, she says. "I would take the kids down to the bus stop, put them on the bus, get back in the house, lock myself in the house, sleep all day 'cause I was up all night, 'cause I couldn't sleep at night because of the nightmares and everything," she says. Things got worse. Rachel and her mother weren't getting along. Unable to hold a job, with no money, she and her two boys ended up in a state-run shelter. That's when Caesar turned to the VA hospital in Boston. Lauren Devor, a clinical social worker and the coordinator of the women's veterans homeless program at the VA Boston health care system, was one of the people at the VA who helped Rachel. The first thing she did was to find Caesar subsidized housing. In the past five to six years, Devor says she's seen more and more female veterans from Iraq and Afghanistan. The women are young, and many have kids. "Now I'm seeing many more women that have actually left their children to go to war and then come back," Devor says. "So you can well imagine a whole new area of work can be done around children feeling abandoned, other people taking on the parent role, then the mother coming back and trying to parent her children." Children present special challenges for a VA hospital -- everything from making sure there are changing tables for babies in the bathrooms to providing shelters for homeless female veterans and their children. It's hard enough for any soldier to ask for help, but without these services, female veterans like Caesar find it even harder. "Similar to male veterans, women who have served in the military are quite strong," says Eve Davison, a clinical psychologist at the VA hospital in Boston. She's another person Caesar turned to. "They see themselves as soldiers, and it can be really, really hard to admit that you need support." Davison, who also works with the National Center for PTSD, says she sees women like Caesar all the time. She says it's not uncommon for patients with post-traumatic stress disorder to have screened positive for something called military sexual trauma. It's a catch-all term, covering everything from sexual assault to sexual harassment. According to the VA, more than 48,000 female veterans screened positive for military sexual trauma in 2008. "I think the general public is unaware of these numbers," says Erin Mulhall, a director of research for the Iraq and Afghanistan Veterans of America, an advocacy group. She adds that the number is probably even higher because many women are afraid to report cases of harassment or assault. At the VA, the burden is not on the veteran to document what happened to them. "It provides free care to any veteran that walks into VA medical centers that screens positive for military sexual trauma," Mulhall says. "It's bolstered training for its mental health professionals on [military sexual trauma] and also provides disability compensation for those that have developed some major health problems due to their trauma." Many women vets don't want to talk about sexual trauma. They don't want to admit it. They don't want to report it. That's what happened to Caesar, who is only now beginning to let people know about what happened to her: "I was coming here for therapy, doing what I had to do, but I was dying inside and nobody here knew," Caesar says.